Wilkinson finds this ridiculous from the standpoint of a collective action problem. In this system no citizen has an incentive to actually donate money to the government; even though everyone benefits from government services like law enforcement and judicial services, individuals would rather not pay and let their neighbors foot the bill for the government services free-riders can’t be excluded from. Similarly, even honest citizens have an incentive to not pay — if an individual rationally expects the large majority of the population to not voluntarily pay for government services then they have good reason to suspect that the total sum of donations isn’t enough to fund a bare-minimum of public services, giving them further reason not to pay. In game theory terms all players, that is everyone in society, has an incentive to defect and in equilibrium no one pays. That’s why forced taxation is the only feasible scheme to reliably fund public goods. Formal taxation seems to date back to the ancient Egyptian Old Kingdom era, making it one of the oldest social institutions in organized human society, and in its 5,000 year history few human societies have found workable alternatives. For Rand’s voluntary system to work human psychology needs to be fundamentally different. It isn’t a question of altruism, but rather rationality. In a world populated by rational, self-motivated actors — that is, the individuals Rand celebrates — a donation-funded government isn’t possible. Image by Wikimedia user Farcaster. 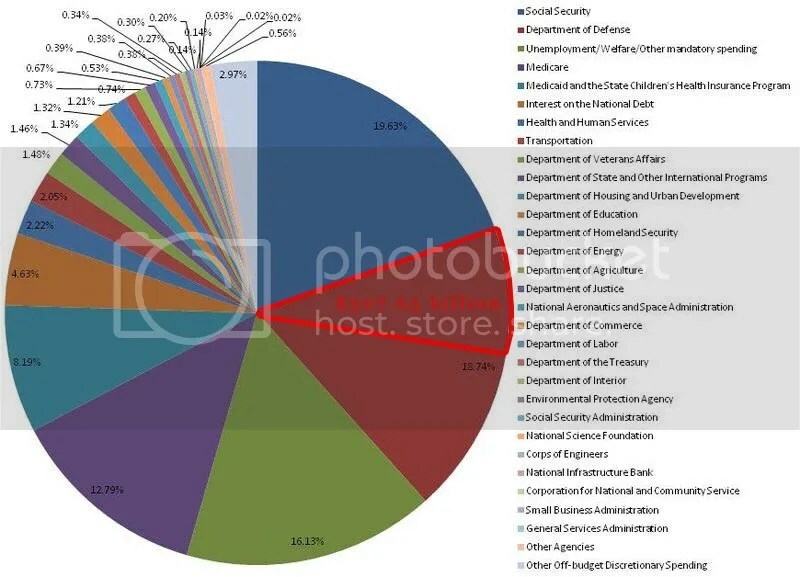 2010 US Federal spending. 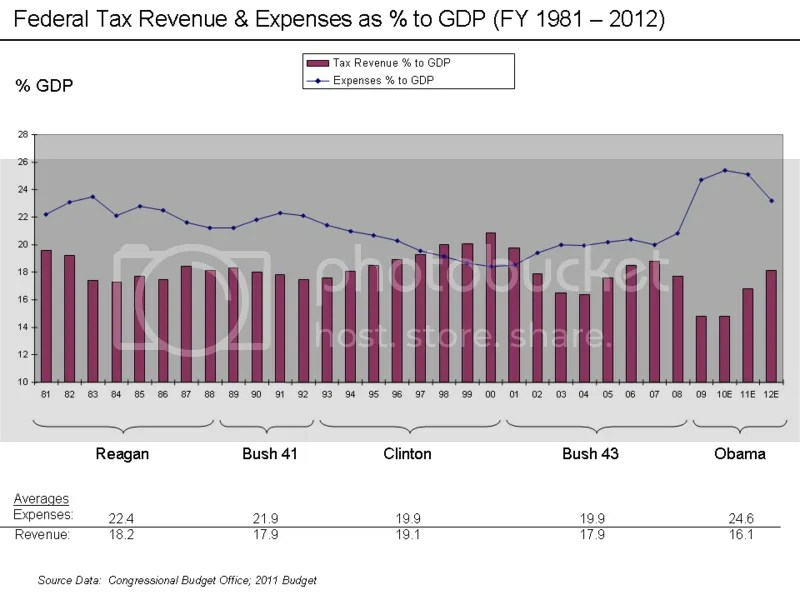 Data source: CBO. All other government services- Social Security, medical entitlements, social and educational spending, national parks, and infrastructure spending- would not be fundable at anywhere near their present requirements under this system. Of course, this makes a lot of assumptions. Charitable giving could easily rise in the absence of taxes, but it’s equally likely that the federal government would be much less effective at attracting charity than private non-profits are today. However, it’s worth remembering that many libertarians like Rand have dramatically lower expectations of government than most people- in their eyes, a 90% reduction in government services would not necessarily be a bad thing. To a libertarian in the mold of Rand the government’s role should be restricted to providing courts, law enforcement, and a military only sufficient for territorial defense. It’s possible a $305 billion dollar budget would be sufficient for this. US military spending could easily fall by 80% if its only role was defending the US homeland, and law enforcement and judicial expenses are insignificant when compared to total government spending. However, it’s unlikely that very many Americans would like to live in the country Rand envisions. Entitlement spending like Social Security, Medicare and Medicaid have been a part of the American social contract for generations. Before the advent of Social Security most American seniors not lucky enough to be wealthy lived in poverty, and many died from preventable medical conditions they couldn’t afford to treat. If the federal budget was reduced to $305 billion, living standards for vulnerable Americans like the poor and elderly would fall precipitously. While many Americans support the idea of vastly lower taxes in the abstract, it’s doubtful that they’re willing to accept a reality where a significant portion of the elderly starve. I long to see that free society where taxation will be purely on a voluntary basis. As much as a donation funded government might significantly cut down on federal government spending such a situation in my opinion can only work on paper and it would be a mammoth task to implement given people’s current mindsets.